In my book, Zen for Everyday Life, I cover everything from A-Z about creating your own daily mindfulness meditation practice. I cover more than 2 dozen exercises and meditations, how to practice mindfulness in daily life, the skills needed to develop a strong daily meditation practice, and my best tips for further enhancing and supporting your practice, all as simply and as clearly as possible with detailed instruction for each exercise. 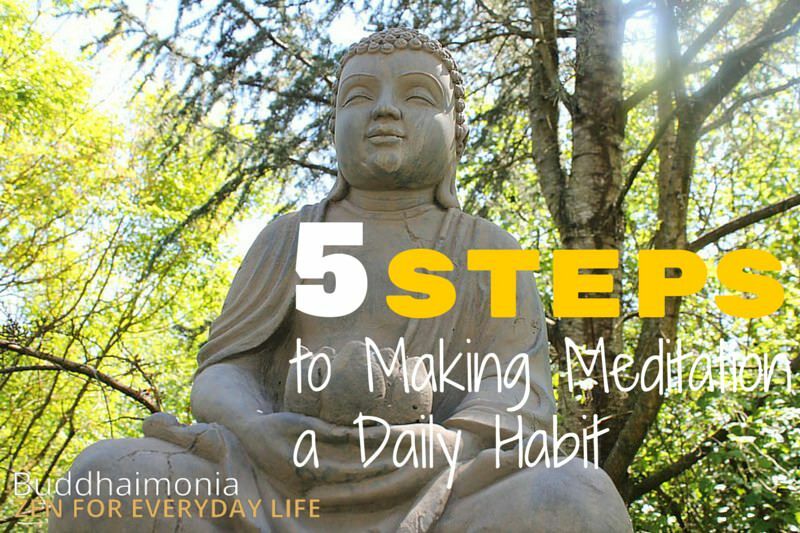 But one thing that wasn't included were my best tips for making meditation a daily habit. I covered the important principles, and qualities, for making a daily habit, but didn't cover the important principles for getting off the ground running so to speak. This post is intended to correct that! So consider this an accompaniment to Zen for Everyday Life, together creating a full-proof resource for developing a daily meditation practice at home with minimal headache. Looking to build your own meditation practice? Zen for Everyday Life shows you from start to finish everything you need to know. When my first son Malik was born I had a very hard time sticking with a consistent meditation practice. I was a night owl and still had the tendency to want to jump head-first into things and tackle them all at once, so the patience required in meditation really didn't sit well with me at first. Becoming an early riser definitely helped my daily meditation practice, but what helped me more than anything else was a simple bit of insight that has to do with utilizing our natural patterns of behavior. When thinking about habits and positive daily rituals, what comes to mind as the most important thing? That is, the most important aspect that you should focus on? Sounds kind of "duh", right? But let me explain. If you wanted to make working out a daily habit, do you want to know the easiest way to do it? Put on your shoes, get dressed in your workout clothes, and walk to your car for a couple of weeks straight. You don't even have to work out. Sounds kind of funny, but I'm serious! Why does this work? It's called the path of least resistance, and it's our natural pattern of behavior as humans. We have the natural tendency to gravitate towards that which takes the least amount of energy, that thing which is the easiest thing to do. And those things which you're used to doing are easier because you're used to doing them. You don't even have to do the actual action because the real obstacle is just getting yourself going. I've developed 5 steps, most of them utilizing the path of least resistance (when possible) in various ways, that make it crystal clear and super easy to develop meditation into a daily habit. Understand that it will still take hard work and dedication on your end, but with that in place, these 5 steps can help you easily make meditation into a daily habit. If you don't schedule the time in advance, you'll just keep coming up with excuses as to why you can put off your meditation session. And after putting your practice off a couple times, finally, you'll quit on it altogether. This is the way anything works, so don't knock yourself over it. I ran into a lot of problems myself developing meditation into a daily habit, and this step, as well as the others, are all about keeping you from having to go through the same headaches. This also helps develop it as a habit because you're doing it at the same time each day, so you grow accustomed to and comfortable with it. And anything that helps you increase the comfort level (the idea in your mind) you have connected with your practice will help you make it a habit. My suggestion? Start meditating once a day in the morning, no matter what time you wake up. Meditation is a great thing to start your day with. Once you set your daily meditation schedule, whatever you decide that to be, dedicate yourself to it. Don't miss it no matter what. And if something comes up that absolutely has to interrupt a particular day's session, reschedule your session for a different time so you still get your session in for that day. Utilizing the path of least resistance, create a meditation space not only perfectly suited to making meditation a daily habit but also the perfect place to find quiet and peace each day. Get a meditation pillow (this is the one I use). Place it down in a newly dedicated area. Place nothing in and around this space ever unless it enhances your practice. Anything obstructing you from sitting (whether mental or physical) is to be removed. Set it in a permanent place in the room with the LEAST amount of distractions (this includes a T.V., computer, windows, etc.). Next, remove any remaining distractions/temptations (TV controller, smartphone, tablets, and anything else "tempting" should all be far from arms reach if not in the other room). The point of this isn't just to keep from becoming distracted. The path of least resistance is about understanding our natural tendencies. What that means is, we generally do the thing which is most easy to do in any given situation. So instead of working out, we pick up the T.V. controller because it's sitting right there, and our workout clothes are in a closet in the other room. Another example would be working as opposed to taking your smartphone out and checking Facebook. If you make Facebook easy to open up, you're going to do it. Even if you just delete the app and block the website on your work computer, even though you can go on your smartphone's browser and log in still, you'll find yourself logging in to Facebook WAY less often because you've added a few extra steps (a little more "resistance") to doing so. It's how we behave naturally, so use it to your advantage instead of being controlled by it. There are various forms of meditation you can practice, but to put it simply, you should start with mindful breathing. 1. It calms the monkey mind and helps you gain clarity - Mindful breathing is the fundamental meditation technique in essentially all meditation traditions as it helps to calm the mind and gain clarity, so it works as a great meditation to build the foundation of your meditation practice. 2. It's super easy. It can be difficult to sit through your crazy, thoughts racing, monkey mind in the beginning. But for the most part, it's the easiest beginner practice there is. In a matter of minutes, you could be sitting in meditation, following your breath. 3. It makes it as easy as possible to expand your practice beyond the cushion. This is a great first meditation to use "off the cushion" so to speak, to bring meditation into your daily life (which I'll talk about in Step 5). So having already been practicing this meditation means it becomes even easier to bring it into your daily life. When starting out, use the path of least resistance again, this time with regards to more "mental" roadblocks. How do you do this? Meditate for just 60 seconds. Yep, you heard that right. Meditate for just 60 seconds. To further that, if you find yourself getting mental push-back about it, just tell yourself to sit down for 10 seconds for the first week. To "complete" this step, make a firm dedication to do this for 15 days straight. Why do I say that? We all know it's best to do something for more days because then you're more likely to make something a habit. But there's real evidence of this significantly improving your ability to make meditation a daily habit. So that's it! Sounds crazy, but this will begin to get you accustomed to sitting down on the meditation pillow, and in a very short period of time, you'll find yourself more and more willing to sit and actually meditate for longer periods. More than anything else, this step helped me develop sitting meditation into a daily habit (on top of being critically important in cultivating the strongest meditation practice possible, as well as to finding true peace and happiness). Practice walking meditation each time you walk down your hall, from your home to your car, or your car into work, etc. Practice driving meditation once or twice a day, to or from work or both. Eat with mindfulness one or more meals a day. As I mentioned, this more than anything helped me make sitting meditation a daily habit. Why? The more often you're exposed to something, the more often and more clearly it stays in your mind. If you practice mindfulness (make the effort to, however small) at any point in your daily life, it helps further support your daily practice of sitting meditation by reminding you of it regularly. It's really as simple as that. But remember, as I said, this helped me more than anything else. BONUS ROUND. Sorry, felt like saying that. This step is simple, yet effective. Developing meditation into a daily habit is one thing, but increasing your session length, even if done naturally, can eventually lead you to the feeling of "ugh, I don't want to sit down for a whole 30 minutes". It sounds counter-intuitive because you're doing something that makes you feel great by nourishing your mind + body, but your mind can be very irrational- don't forget that. Split your session into 2 different daily sessions of 15 minutes. Sounds weird, but it's super effective. Of course, sitting down for 30 minutes at a time and sitting for 15 minutes two different times on a given day aren't the same thing, but there's not much difference (it might even be more effective) and it leads to a stronger practice overall. Most importantly, this will help you expand your practice. Also, with time you'll be able to break the rut and expand into greater lengths of meditation.